This item is sold as a single piece, not as a pair. 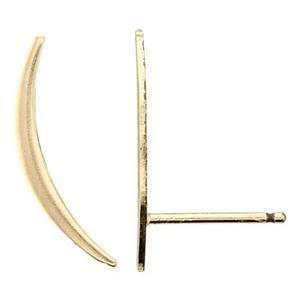 14/20 Gold-Filled 1.6x16mm 22 gauge Swoop Climber Earring, .7mm Post Thickness. Clutches not included. Order 2 pieces to get one pair of earrings. One Fell Swoop - One Swell Swoop. You get Both with Our GF17R – 14/20 Yellow Gold-Filled 22 Gauge Swoop Climber Earring. An elegant curve that goes up the earlobe instead of dangling below. You’ll want to Swoop these up! Please choose from our Gold-Filled Earring Clutches to keep your Earrings from Swooping Away. Notes: Each pair of earrings contains one right side and one left side.